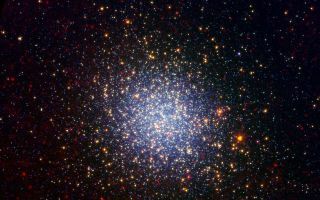 Called Omega Centauri, the sparkling orb of stars is like a miniature galaxy. A cluster brimming with millions of stars glistens like an iridescent opal in this image from NASA's Spitzer Space Telescope. Called Omega Centauri, the sparkling orb of stars is like a miniature galaxy in this space wallpaper.In this new view of Omega Centauri, Spitzer's infrared observations have been combined with visible-light data from the National Science Foundation's Blanco 4-meter telescope at Cerro Tololo Inter-American Observatory in Chile.